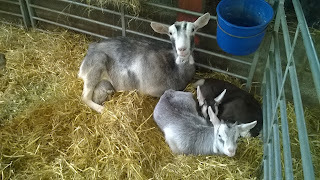 Frequent visitors to our little blog will recall many posts about our dear Husky goat. We have followed her antics since she was a baby, through her stroppy goatling year (remember us having to quarantine her to stop her jumping in with all the boys?!) and then as a responsible parent to Monkey and her siblings. 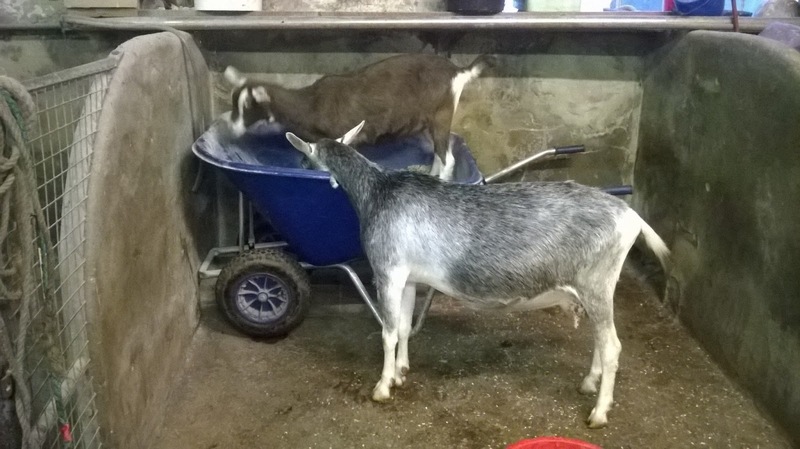 Although she is a valued milking member of the herd, she is also something of a special goat and everyone at Ellie's Dairy has a bit of a soft spot for her. And boy, does she play on the attention! But our dear Husky has had a traumatic few months and, now she is safely out of trouble, I thought it was about time to tell you the tale .. But, a few days after kidding, Husky fell seriously ill and we had to fight to save her. After a couple of horrendous days, we pulled her through but she was left with a very nasty gangrenous mastitis in one side of her udder. Things did not look promising .. we have seen this only twice before and, in both cases, we have lost the goat. I won't dwell on the details but it's all pretty nasty - basically, a large part of the udder turns black and cold. Then it dies off and falls away. We called our lovely vet Peter in to help us make the decision - should we continue to fight or would it be kinder to send Husky to goatie heaven? Totally impartial, Peter said that he thought it was worth fighting for her. Smiles all round from us and the vet students who had all been expecting the worst! So, we carried on ... a lot of care and attention was lavished on Husky. Bucket loads of special lavender and olive oil cream carefully applied by a succession of vet students, endless cleaning and checking, constant monitoring and lots and lots of bananas!! We also decided to leave the boys with her for company and to keep her stimulated. 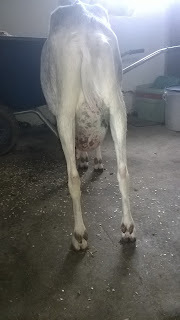 Also, as one side of her udder was perfect and full of milk, it was better to let the boys feed rather than put her through the trauma of having to be milked twice a day. 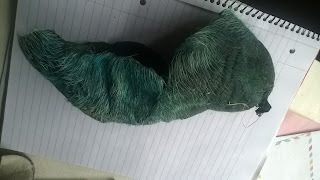 Eventually, it all dried up and fell off. Imagine my surprise when I found this in the straw early one morning! 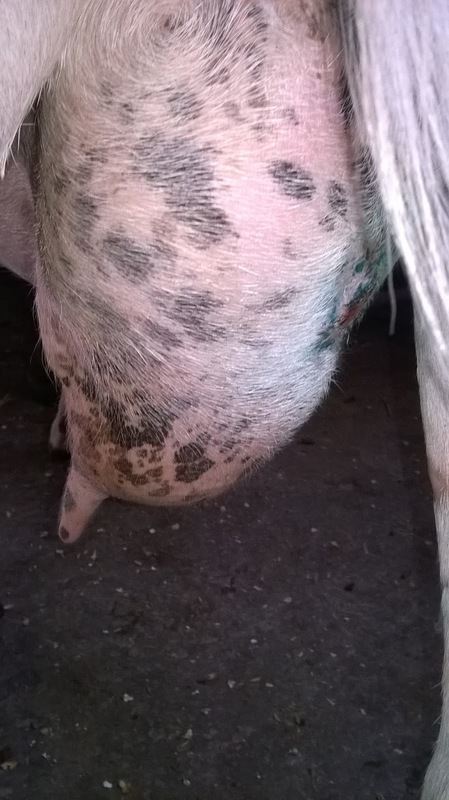 A perfectly formed half an udder!! But we have decided that once the boys are weaned, she will be dried off and will never be put in kid again. 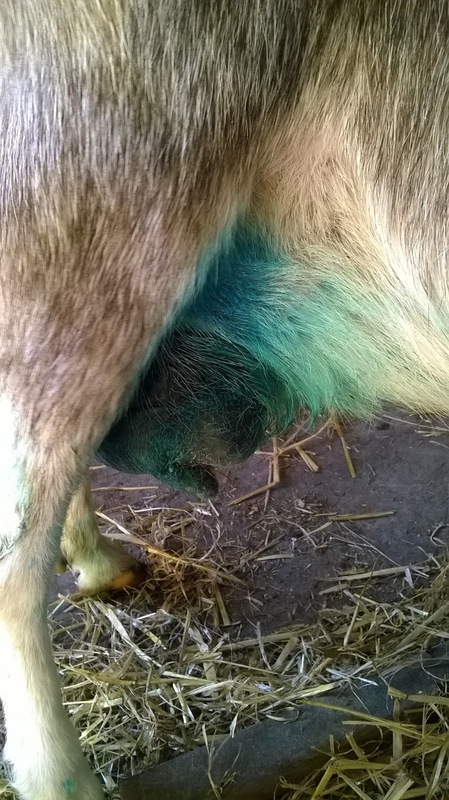 She will retire from milking and will become a purely ornamental goat! And we are certain that Husky will be very happy with this arrangement as she will never have to work again! Who feels silly now then?! The return of the dairy fairy ..